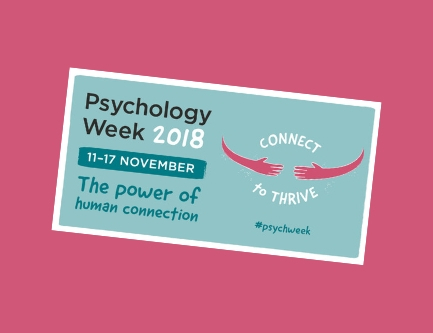 Psychology Week 2018 focuses on the Power of Human Connection. This topic also fits really well with what we aim to promote at Your Health Hub! Is described as the sense of distress felt from social disconnection. Social relationships support good mental and physical health. By contrast, feeling lonely and disconnected can lead to depression and stress. Over time, people are becoming increasingly lonely, so it’s important that we address some of the factors that perpetuate loneliness and offer strategies to assist people who struggle to make positive connections with others. In the field of Positive Psychology, it’s well known that feeling happy is associated with one’s sense of connection and positive relationships with others. Accordingly, a filmmaker by the name of Roko Belic produced a documentary called “Happy”, in which he interviewed people from all over the world to find answers in the search for happiness. He discovered that the key factor was strong relationships with others, not wealth or fame. People could be very rich but still feel lonely if they have no meaningful connections with others. When I worked in the field of drug and alcohol addiction, many clients reported a lack of connection/meaningful relationships with others and this was often associated with difficulty and processing unpleasant feelings. They would instead turn to alcohol or drugs to manage these feelings. In the same way, people who describe themselves as engaging in emotional eating use food as a way to briefly change their feelings or to distract themselves from negative emotions. Loneliness and boredom are two of the common triggers that lead to people experiencing cravings for sweet or savoury snacks. Is often a source of love and connection for many people, which is why they turn to food as a “comfort” instead of reaching out to others. Additionally, many people spend a large portion of their time caring for or helping others and often forget about making time for themselves in the process. People often describe to me a sense of emptiness or feeling emotionally and physically drained, that is often filled by overeating. It is so important to combat this by providing people with other ways to nourish and reward themselves, and to lead more fulfilled and meaningful lives! For this reason, we really encourage clients to focus on their own self-care by including more activities that will bring them a sense of pleasure, accomplishment and relaxation for themselves. Working on their health-related goals is a great way to achieve this, but it is important to feel connected to others in the process. Loneliness can mean there is less incentive to exercise by oneself. Here at the Hub, we have a number of classes at our Health and Fitness Studio. Is, therefore, a useful way to build motivation, and especially to feel a sense of connection in terms of having common, health-related goals with a positive and supportive environment. A number of clients who are addressing weight-loss goals have reported an increased sense of wellbeing and happiness since attending group classes at the gym. And that positive feedback has given them the confidence to increase their social network by engaging with other group activities and organisations. In this way, their opportunities to establish friendships is increased and their sense of loneliness is further reduced. Human connection really IS the ultimate antidote. Nolene is one of our Clinical Psychologists here at Your Health Hub. Her current professional focus is in the area of Weight Management and Food Addiction. She also is registered with the Australian Health Practitioner’s Regulation Agency and a member of the Australian Clinical Psychology Association.